The second game of Al Kass 2018 saw Benfica run out comfortable 4-0 victors against Guangzhou Evergrande, who could nonetheless be proud of their determined defensive display. The pattern that the match would follow was quickly established, with the Lisbon youngsters’ quick passing technique countered by feisty defending from the Chinese. Benfica youngster Sandro De Cruz was an early victim of Guangzhou’s physical approach, hobbling off after just five minutes to be replaced by Joao Ferriera. Benfica’s dreadlocked Jair Tavares soon caught the eye, with his deft footwork and distribution proving a constant threat own the left. Meanwhile, Bernardo Da Silva kept things ticking over in central midfield. With the game 20 minutes old, Goncalo De Oliviera almost broke the deadlock for Benfica, forcing a smart save from Xiaofeng Wang after sprinting clear through the middle. Indeed, the Evergrande keeper was by far his team’s most accomplished performer in the opening period, making a string of fine saves to keep the game goalless, despite the one-way traffic. De Oliviera was again inches away from scoring on the half-hour mark, but was unable to connect with Tavares’ low cross from the left. By now, the match resembled a training game of attack versus defence, with Guangzhou showing little appetite for forward play, their burly striker Pahaerding Airexiding cutting an isolated figure on the halfway line. Still, it took a moment of magic for Benfica to take the lead, and it arrived courtesy of Hugo Nunez, who dribbled through the Evergrande defence before spinning away from two defenders and applying an accurate finish – an early contender for goal of the tournament. Minutes later, De Oliviera received the reward that his fine forward play had warranted, beating Wang at close range, after the keeper had blocked his initial effort, to put the Portuguese two up. The second half got underway with Guangzhou still exhibiting little attacking intent. Benfica could afford to keep a high defensive line, their back four seldom required to retreat far from the halfway line. Just before the hour mark, with little prospect of Benfica squandering their lead, manager Francisco Candeias made a double substitution. His team continued to play the same patient passing game while Guangzhou – to their credit – defended stoutly. Their resilience was almost broken for a third time on 62 minutes, when the impressive Tavares cut in from the left and unleashed a rising, angled drive that Wang just managed to tip onto the post. Tavares’ persistence bore fruit soon after, however, when he embarked on a mazy run down the left before delivering a low cross for De Oliviera to prod home for his second of the game. With 70 minutes gone, Benfica had the ball in the net for a fourth time, only for Tiago Gouveia’s effort to be correctly ruled offside by referee Yousef Al Sharshani. Five minutes later – with just a quarter of an hour remaining - Guangzhou fashioned their first and only chance of the game, when Yujie Zhang ran on to a through ball and attempted to lift the ball over retreating Benfica keeper Samuel Soares, but his attempt was heroically saved. 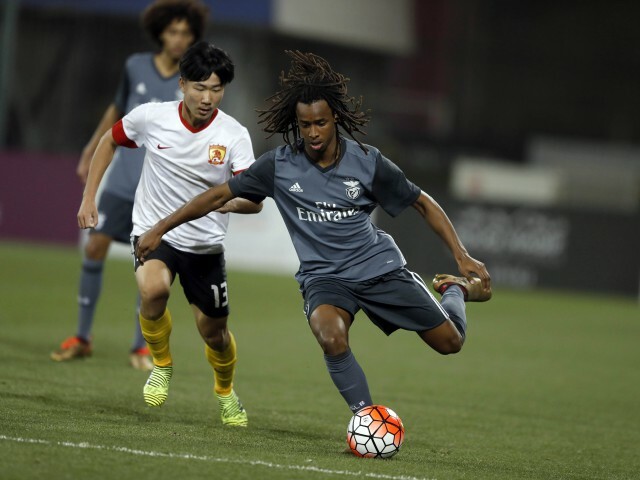 It was little surprise when Benfica added a fourth courtesy of the lively Nunes, who blasted home from short range past the unfortunate Wang – Guangzhou’s standout player. Yet there was still time for the Chinese keeper to further highlight his ability when, moments later, he touched Ronaldo Camara’s rasping effort onto the bar with a superb flying save. The 4-0 result in no way flattered Benfica, who showed enough talent to suggest that they could go far in this tournament. Indeed, but for some tenacious Chinese defending and equally profligate Portuguese finishing, the scoreline could have been even more convincing.